Snippets of Jack: "I Now Pronounce You . . ."
"I Now Pronounce You . . ."
As I am anxiously awaiting the arrival of Hurricane Sandy, I thought I might type up another post before she knocks out my power. And the thought has just occured to me to write a post about a different epic storm that occurred in the Pirates of the Caribbean: At World's End. This wasn't exactly a hurricane though, it was a Maelstrom. Now, the Brethren has reached its point of no return: they've agreed to fight the E.I.T.C. armada and even Davy Jones and have even opened fire on them. If you're going to be a bear, be a grizzly, so the crew of the Black Pearl begin to board the Flying Dutchman and vise versa, swiming across the maelstrom in the middle. Will Turner and Elizabeth Swann stand read on the deck of the Pearl to attack whatever enemy makes it over. Barbossa even manages to take down some people while steering the ship. That takes skill. Elizabeth and Will decide to also multi-task. Will: "Elizabeth. Elizabeth. Will you marry me?" You know that moment when you watch a movie and the two people you've been willing to go out finally kiss? And you're just so happy and find it the cutest thing in the world? Yeah, I don't really feel it at this scene. He finally pops the question while their stabbing freaky "fish people". They grasp hand for a second, and then return to battle. Elizabeth: "I don't think now's the best time." I mean, you're only fighting three people at time. I think there's time for a marriage. Will: "Now may be the only time." It's as though Will knows he's going to cut out his heart momentarily. The both stab British soldiers in the gut. How romantic. This gives them a moment to embrace again. Will: "I love you." Okay, now all the feelings and hormones are starting to kick in. Of course, they have to kill a few more people first. Will: "I've made my choice. What's yours?" Okay, instead of saying yes or even killing more people, Elizabeth does something even more surprising. 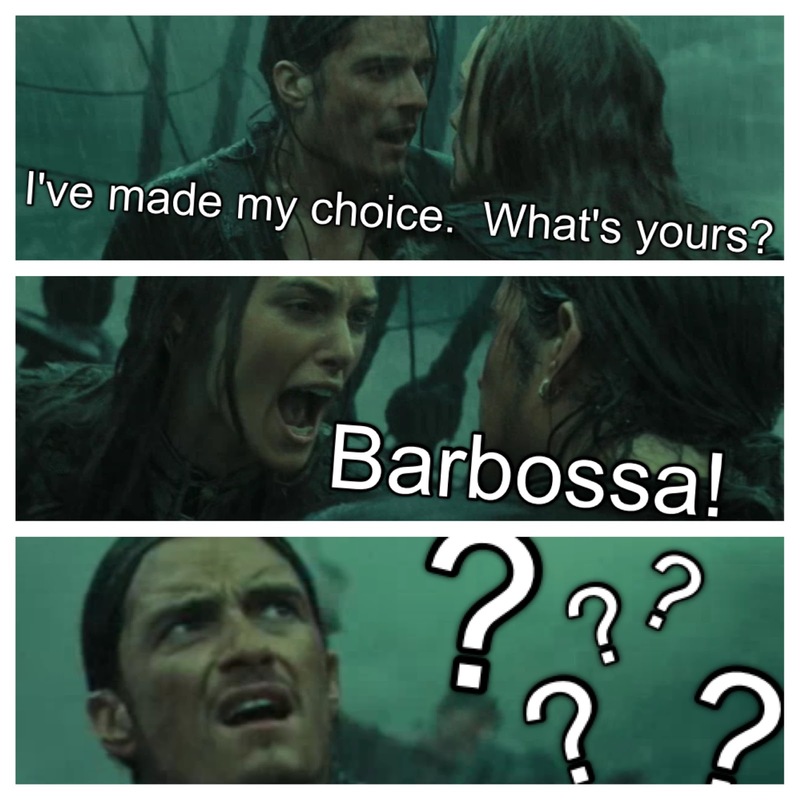 Elizabeth: "Barbossa!" Umm, what? Will just gives her this look of complete confusion, like a "I thought you hated him and he freaked you out" kinda look. And then he gives a look of utter repulsion to Barbossa at the wheel. Then all becomes clear. Elizabeth: "Marry us." So, she wants Barbossa to be both her and Will's husband? Actually, I think she wants him to perform the ceremony, because as spectacular as Barbossa looks I don't think anyone really wants to marry him. Barbossa: "I'm a little busy at the moment." Thank you! Finally some common sense. The happy couple gets back to fighting a bit more, but can't stay separated for long. Will: "Barbossa, NOW!" Barbossa: "Fine, then." He doesn't seem to happy to do it though. He stands up above everybody else and the couple embraces again. Barbossa: "Dearly beloved, we be gathered here today . . . To anil your gizzards to the mast, you poxy cur." Uh, I don't rember that being part of the wedding rights . . . Oh yeah, their in the middle of a war. Will just gets to the point though. Will: "Elizabeth Swann, do you take me to be your husband?" Aw <3 Elizabeth: "I do!" Will: "Great!" That's also not what you usually say during a traditional wedding, but I guess this is not your average wedding. Elizabeth: "Will Turner, do you take me . . . to be your wife . . . in sickness and in health . . . with health being the less likely?" Actually, your probably more likely to die from being stabbed than a disease because during all those elipsese, their fighting people with one hand and hold their fiance with the other hand. Meanwhile, Barbossa is intensly fighting five soldiers, even stabbing one between his legs. Will: "I do." Okay, Will can make even two words some incredibly hot. Barbossa: "As captain, I now pronounce you . . . You may kiss . . . " Wait, Barbossa just has to shoot someone in the face and laugh about it. The couple tries to kiss but of course, the have better things to do like save their lives. 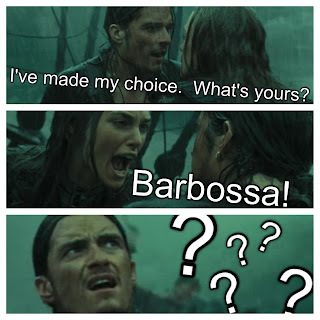 Barbossa: "You may kiss . . . JUST KISS!" After their swords touch, their lips finally do too! And then they keep kissing for quite a while. We even get a 360 degree shot of it! Nobody tries to interrupt them then. Pintel, Ragetti, and Jack the monkey's hearts are even melted by such romance. That was cute, but now back to the fighting! I am so gonna get married like this!